Avril confirms is herself, the album will be out in September! Avril is appearing at the 2013 Billboard Music Awards this Sunday, May 19! No word on if she is performing or only presenting, though. Avril is performing tonight at 102.7 KIIS FM's Wango Tango in Carson, CA! Check out images of Avril on the orange carpet, onstage and backstage. Click here for performance videos. In Part Two of our exclusive interview with Avril Lavigne, we chat about collaborations on her fifth studio album with shock-rocker Marilyn Manson and fiance Chad Kroeger of Nickelback. Avril also reveals a secret collab with a high-profile female pop star, and discusses why she tends to prefer working with men over women. Read her answers below and catch up on Part One of the interview here, where Avril discusses never growing up, living in the moment and her love of scrapbooking. There are some pretty interesting collabs on the album that you’ve teased so far. Marilyn Manson - how did that come about? I wrote a song called Bad Girl. It’s a heavier tune and I thought his voice would be perfect on it, so I hit him up. I called him and he came over to the studio and he really liked the track and he just put some vocals down on it. He was a pro and he did an amazing job. I really appreciate him as an artist and I love his style and I really respect him and his art, and I thought it was really cool to have him on this record. What was he like in person? And what was your relationship like? We go way back. I met him when I was 18, went to his show and hung out backstage, and he’s just really smart and he’s very artistic, and he really likes music, and he’s a great performer, and he has his own style that I think is dope and…. he rocks! He puts on a great concert live and he also is dabbling in directing, directing music videos and short films and stuff like that, so he’s a very creative man. You've also got collaborations with Chad Kroeger on the album... can you tell us a bit more about those songs? There’s a duet. Yes, I have a ballad with Chad which is kind of like a love ballad that we sing together. I have a song called Hello Kitty, which I wrote about Hello Kitty because I’m obsessed, and it’s a really fun thing that I’ve never done before. It kind of has a kind of glitchy, electronic feel to it and it’s... the only one on the record that sounds like that. It’s really different and a lot of my friends I’ve played it for really like it. I’m having a lot of fun with that one. Q: Do you have any idea what’s going to be the next single? I think probably a song called Rock and Roll. So tell us about it! To me... it’s rock and roll, it’s a way of life - it’s a fashion, it’s a spirit and it’s also very similar to the first single. You know, the rock and roll spirit like, 'WOOOO!' and going all out. And it’s LOUD, impressive and it stands for so many other things than just music � that’s really what it comes down to - and it’s a song that I’m just putting the final touches to now. I wish I could tell you more about it, but you’ll have to wait. Speculation for the female collaboration could be Miley Cyrus since they are both following each other and have the same manager. It could also be Cassadee Pope since she is a huge fan and has already sang with Avril or Cher Lloyd who is signed with Epic... Who do you think? 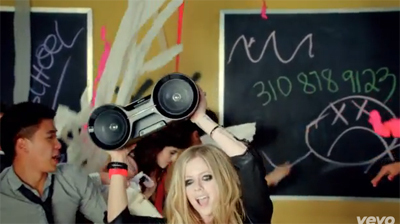 If you've noticed in the "Here's To Never Growing Up" video, there is a phone number written on the chalkboard in the background. The number is 310-878-9123. When you dial it, HTNGU music comes on and a voice says "Avril Lavigne is launching a secret project. Press 1 to sign up for text updates or call back."... Wonder what it could be??? If you want to call the number, look here for instructions, otherwise I will keep everyone updated with news regarding this. I don't know if you will be charged money for calling, so only do so at your own discretion. UPDATED WITH HIGH QUALITY SCANS! Avril graces the May 27 cover of HELLO! Canada's "Canada's 50 Most Beautiful Stars" edition. Check out the sneak peak below, before higher quality scans come. What do you think??? SUPER FUN! I am in love with the "Complicated" scenes! HTNGU - FIRST 30 SECONDS! Watch the first 30 seconds of the Here's To Never Growing Up music video, out tomorrow! !